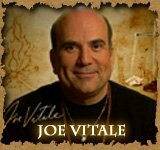 Known as the Father of Hypnotic Marketing and Mr. Fire, Dr. Joe Vitale is a prolific writer, powerful speaker, and has starred in eight films including The Secret. With a combination of the spiritual and practical, Vitale’s self-help audio books, eBooks and programs were definitely a part of my inner journey and bulimia treatment as I learned the keys to lasting recovery. Joe Vitale practices what he preaches. He’s a leader in the world of teaching the Law of Attraction and uses it to manifest everything he’s achieved in his life. And he’s achieved big things, so there’s much to be learned from this self-help guru! Joe Vitale is just like you and me. (ok, maybe he never had an eating disorder, but we won’t hold that against him.) He’s suffered losses and had to make it the hard way before discovering how to attract the things he had only fantasized about. In the 1970’s he lost his job and was even homeless living on the streets of Houston. But, he had a spiritual growth moment where he realized that the power to change was in his hands. Through deep inner work he manifested a chain of events that changed his life in huge ways. Now he’s a highly successful, sought after speaker and author who is one of the most well-respected miracle attractors on the planet! Vitale has used his tried and true techniques for success for over 25 years, and they apply not just to making money, but to any goal you may have for improving your life. He is a master hypnotist and has created the Attract Miracles Community, a constantly growing community of people dedicated to improving the world by first finding their own positive paths. Working with the Law of Attraction (LOA), Vitale has created many wonderful products to further spiritual growth on the planet and help with your bulimia recovery. Here are some of my personal favorites. One of his best self-help eBooks, this explores what Vitale calls the Four Stages of Awakening. Reading this book will help you identify and then achieve your goals through mental, physical, and spiritual transformation. Unlike the other courses out there about LOA, The Awakening Course is the only one that touches every aspect of the Law of Attraction in such a comprehensive manner. You’ll finally “get it” if you’ve ever had trouble understanding or manifesting with the Law of Attraction. This is a breakthrough course for Joe Vitale who teaches you how to realign yourself with the Universe so that you can finally have what you want in your life. With The Awakening Course, you will completely transform every area of your life including. …and much more spiritual growth than ever before! This is an amazing audio book that offers subliminal messages to unlock the power of giving and receiving. It comes as a DVD and helps the unconscious mind open to abundance by reinforcing positive habits. If you’re looking to expand your spiritual growth you can benefit from the messages here, especially in the area of an addiction or eating disorder. Take a look at this video clip to get an idea of its power. As one of the best self-help audio books on the market, I highly recommend it for anyone who is on the path of bulimia recovery. If you’re ready to finally become a productive, focused, giving person…click here to download Give to Live free and start now!